One for the library, "The Limey" requires your undevided attention on the small screen because of its largely unspoken mood. Can't be walking in and out of the room during this one. Director Steven Soderbergh's "The Limey" is everything the recent Mel Gibson vehicle "Payback" wished it could be. I liked "Payback," but it was an amusement park ride without depth or feeling -- just a guy with a short temper and a gun with an endless magazine clip. "The Limey" -- like "Payback" -- is violent, primal, revenge fantasy, set against the perfidious underworld of the Los Angeles music industry. But unlike "Payback," it is not an action flick with a dark candy center. It's far more cunning, poetic and abstract. It is to gritty crime flicks what "Unforgiven" is to Westerns. Terence Stamp (at his somber best) stars as an aging, wrathful and freshly-paroled Welsh tough who has come to L.A. to avenge the death of his daughter -- a street-smart aspiring actress he's positive was murdered when she perished in a fiery car crash while he was in prison in Britain. He's here to assign blame, and brother, do not get in his way. With little to go on but a few names, Stamp soon has in his sights a rich, oily record executive (Peter Fonda) with a penchant for 20-year-old honeys that he trades in every few months for the latest model. Stamp's daughter was one of them and may have known too much about Fonda's debt-related entanglements in street-level organized crime. Our anti-hero interrogates his way though associates and flunkies to Fonda, found at his posh, post-modern Hollywood Hills cliff house -- but along the way he receives a vicious beating and several death threats, to which he quickly responds in kind, backing it up with bullets and without compunction. Aided by two of his daughter's friends -- her voice coach (Lesley Ann Warren) and an Echo Park hoodlum she knew from acting class (Luis Guzman) -- Stamp begins piecing together his daughter's last days while remembering her to his benefactors in abrupt, introspective flashbacks. 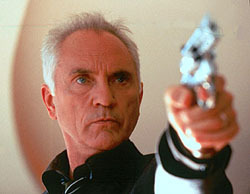 For parts of the character's history, Soderbergh lifts footage from a 1967 film called "Poor Cow," in which Stamp played a young thief, implying that "The Limey" is in some ways a sequel. The film is driven by sly, tense, abrasive performances and a provocative, arresting, energetic filmmaking style. Soderbergh does not depend on linear storytelling, and he gives "The Limey" a breathless momentum by editing it in such a way that no shot lasts more than 10 or 12 seconds. He'll interlace footage from early in the picture (Stamp simmering with bloodlust on the plane from England) or footage from scenes still to come (Fonda nervously holed up in a beach house) into the unfolding story to illustrate emotions or build anticipation. He creatively edits conversations so that at times the audio and video are from different moments, the contrast forcing you to explore Stamp's face, drawing subconscious perceptions about his character from his voice and his demeanor independently. As the vengeful father who clearly has known no life outside of crime and violence, Stamp is brilliantly deliberate. He speaks in measured and forceful sentences, practically pausing between each word to emphasize that you'd better listen and listen good. He seethes controlled anger with every breath. In one exemplary scene that comes after his pursuit of revenge gets in the way of a narcotics investigation, Stamp turns the tables a DEA agent while being questioned, reaching an understanding with his interrogator regarding his personal mission without revealing much of anything about his precise intentions. Fonda is so slick as the repugnant snake of a music exec that you can almost smell him, yet you almost feel sorry for him, too. He's a guy with no scruples, but he isn't evil -- he's just in way over his head. What's more, his role in the girl's death is not immediately clear, except in Stamp's mind. Coming off of his own big studio production, "Out of Sight," Soderbergh shows he hasn't sold out by making such an audaciously contemplative film out of a script (by Len Dobbs, who co-wrote "Dark City") that Hollywood would have watered down to a scowl on a $20 million star and a spray of bullets. Soderbergh understands the principles of action and tension -- he demonstrated that in "Out of Sight" and does so again the climax of "The Limey," a gripping, near-silent ambush on Fonda's Big Sur hideaway -- but he's a director who challenges his audience. You cannot check your brain at the door with this man behind the camera, and it's his intelligence-assuming approach that makes "The Limey" a unique step above its genre.